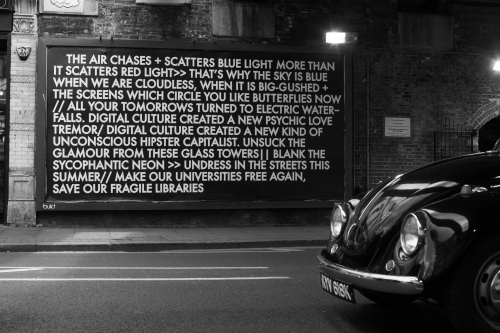 Thomas Dekeyser wrote a nice blog post on Robert Montgomery's work that I think does a good job of navigating his desire for subvertising work to always be illegal in order to retain the most powerful critique of capitalism and the systems that help to perpetuate it. 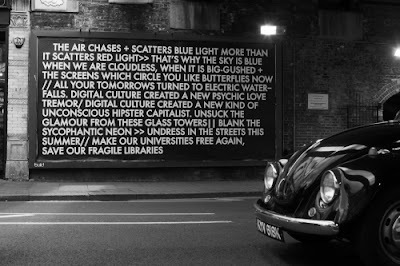 Montgomery's work isnt always illegal and yet it is incredibly powerful so parsing these two thing out isn't easy when you want to see the world in black and white. Well worth a read as Dekeyser is becoming one of my favorite thinkers on this topic.